Pebble Beach is an unincorporated residential and resort area located on the southern tip of the Monterey Peninsula, west of Monterey and north of Carmel-by-the-Sea. 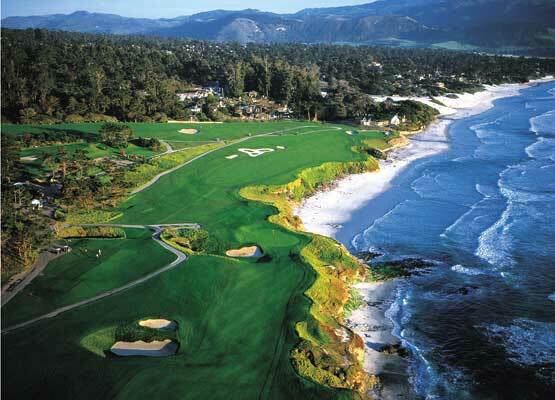 The words “Pebble Beach” are synonymous with golf. Here, golf is not just a pastime, it is star-studded, championship caliber, and legendary. Pebble Beach is home to seven world-famous public and private courses, with the most famous being Pebble Beach Golf Links. The other grand names of golf are Spyglass Hill, Poppy Hills, the Links at Spanish Bay, and the private Cypress Point. This gated community is nestled in the lush Del Monte Forest. The Lone Cypress, one of California’s most famous landmarks, is found along the shores of Pebble Beach. This remarkable old cypress tree stands against the Pacific Ocean clinging to a seemingly bare rock. Over the years, this single tree has come to symbolize Pebble Beach and has inspired many regional artists. Pebble Beach is also known for its scenic 17-Mile Drive. A private toll road, this stretch of roadway explores some of the most impressive housing and spectacular vistas in Monterey County. Drivers will also pass Bird and Seal Rocks, home to countless shoreline birds and herds of sea lions.